Wondering if you should visit the Palatine Hill Rome? It's included in your Colosseum ticket, and in my opinion, it's one of the best sites you can visit from Ancient Rome. From the Aventine Hill, you can look across the Circus Maximus to see this gorgeous stretch of palatial structures on Rome's Palatine Hill. Find out everything you need to know, including how to skip the line, the best way to visit it, what there is to see, and much more! I love the Palatine Hill and think it's one of the things you should not miss on a visit to Ancient Rome (which includes the Colosseum). Even just walking around the Palatine Hill is a delight - you get to see ruins all around you, and imagine how the emperors once lived here. What is the Palatine Hill and why should you visit it? What is there to see on the Palatine Hill Rome? What is the best way to visit the Palatine Hill? How much does it cost to visit the Palatine Hill? Are there any discounts? Can you visit the Palatine Hill with the Roma Pass? What is the S.U.P.E.R. ticket and should you get it? Can you upgrade to the S.U.P.E.R. ticket once you've bought a regular one? Where to buy skip-the-line tickets to the Palatine Hill Rome? How long does it take to visit the Palatine Hill Rome? When should you visit the Palatine Hill? Where is the Palatine Hill, how do you get there, and where are the entrances? Can you eat in or near the Palatine Hill? Is it possible to visit the Palatine Hill Rome in a wheelchair? Where are the bathrooms on the Palatine Hill Rome? The boys then went on to fulfil their destiny of ruling over this hilltop settlement until they fought it out and Romulus killed his twin Remus, establishing himself as the first King of Rome. The Palatine Hill is one of the original 7 hills of Rome. In fact, it's the oldest. It's also where Rome was founded (on April 21, 753 BCE, by Romulus and Remus, according to legend). The ruins you can see on the Palatine Hill stretch from the time of the founding of Rome all the way through the Roman Empire and even into the Renaissance (when some nobles decided it would be nice to plunk some homes and gardens there). When you visit the Palatine Hill, you can see the enormity of the emperors' palaces. In fact, the word "palace" comes from the word "Palatine." Entry to the Palatine Hill is already included with your Colosseum ticket, so yes, you should definitely visit it! At the very least, a visit to the Palatine Hill will give you one of the most stunning panoramic views over Ancient Rome. From the Palatine Hill Rome, you get this iconic view of the Ancient Roman Forum below you. 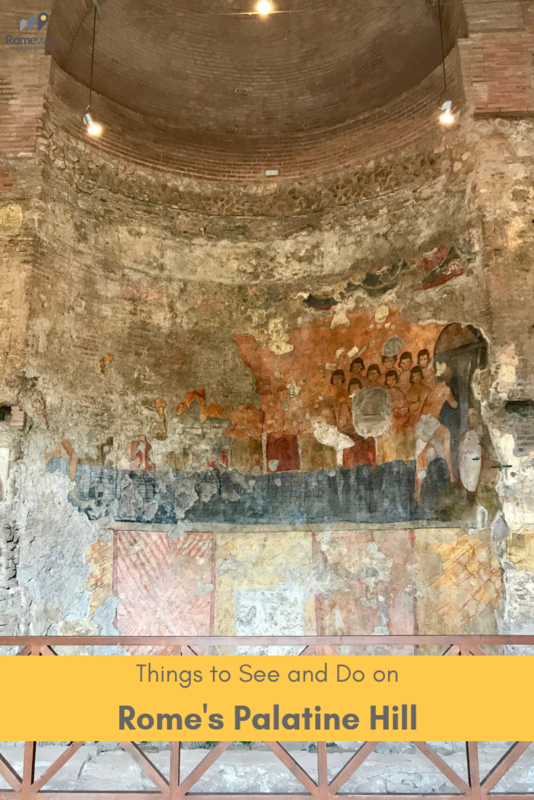 There is so much to see on the Palatine Hill that even after several visits a year over several years of living in Rome, I have not seen it all. Just to be clear, Romulus is almost certainly a legendary character, even though it's true that people inhabited this area in the 8th century BCE. Augustus, on the other hand was very real. He was the first emperor of Rome. His reign lasted from 27 BCE until his death in 14 CE. This is pretty amazing to me. Apparently the first emperor of Rome, Octavian Augustus himself, ordered archeological excavations on the Palatine Hill. Upon discovering artefacts from the iron age, Augustus declared the Palatine Hill to be the birthplace of Romulus, and hence, of Rome itself. The nobility of Ancient Rome (long before the Roman Empire) built houses on the Palatine Hill, and eventually it became the site for the grandest palaces of the Roman Emperors. Up on the Palatine Hill Rome, one of the things you can see is this group of ancient structures, presumably the huts where Romulus, founder of Rome, lived in the 8th century BCE. Emperor Domitian, of the Flavian Dynasty (the guys who built the Colosseum, and the stadium where Piazza Navona stands today), built one of the largest palatial complexes on the Palatine Hill. These ruins we see all over the Palatine Hill were structures used to support huge palaces of Domitian and other Roman emperors. Domitian's palace, stretches across much of the Palatine Hill, and has enormous barrel vaults and arched walls. Other emperors, including Tiberius, Nero and Septimius Severus, also built palaces here, sometimes on top of previous structures. We are not exactly sure what this beautiful structure was used for, but we do know it was part of Domitian's palace. Often referred to as Domitian's hippodrome, this giant oval space high on the Palatine Hill may have been part of Domitian's garden, or a gymnasium or training ground. It's kind of hard to imagine, but this was the basis of a fountain in Domitian's palace. You see it from above. Look carefully at the walls around the fountain and you can see some 2000-year-old paint remnants. Since it's hard to imagine what so many of these buildings looked like, below you will see a rendering of Domitian's Palace as it probably looked in his day. Go check out Maquettes-Historiques.net for more excellent renderings by André Caron of a lot of the structures I am talking about on this page. Rendering of Domitian's Palace as it must have looked when Domitian was alive (late first century CE). Shared with permission from André Caron of Maquettes-Historiques.net. This is another structure that was the basis of a fountain. This elliptical structure was part of a fountain in the Domus Flavia (Domitian's palace). What's so fantastic about this, besides its shape, is all the intact marble flooring around it. Beautiful floor designs are still visible all over the Palatine Hill Rome. I love these colorful marble floors near the elliptical fountain of the Domus Flavia. Check out that beautiful pattern. Next time you visit the Pantheon (designed just a few years later, in about 117 CE by Hadrian), or perhaps Trajan's Market (Trajan was Hadrian's dad, so around 100 CE), check those floor patterns. I believe Domitian may have set the standard for imperial floor design! Speaking of floors, how about this section with this crazy undulating marble, which was probably a triclinium (dining area). This section, and the oval fountain above, are part of what is known as Coenatio Iovis (Jove's dining area). Or, it may have been just an area where the emperor could receive guests. All of this is part of Domitian's Palace, which, at about 50,000 square meters, was one of the largest built on the Palatine Hill. High on the Palatine Hill Rome, you can spot the triclinium of the Domus Flavia with its beautiful, if not quite even, marble floors. This octagonal fountain was yet another part of the Domus Flavia (Domitian's Palace) on the Palatine Hill Rome. Next to the Triclinium (above), and the Palatine Museum, you can also make out the octagonal shape of yet another nympheum (fountain) that was part of Domitian's Palace. While there is not much left of it, you still get the sense that this was a pretty sumptuous structure. All the way on the other side of the Palatine Hill from the above structures, and just next to the main overlook, there are some lovely rose gardens, put there in the Renaissance by Cardinal Farnese (nephew of the Farnese Pope , Paul III). This pretty garden high on the Palatine Hill is lovely when the roses are blooming. There is also a drinking fountain nearby, a panoramic overlook, and the larger Farnese gardens (below). In the 16th century, Cardinal Alessandro Farnese (see above) built what is considered Europe's first botanical garden right here on the slopes of the Palatine Hill Rome. They included a huge variety of plants, fountains, aviaries, and grottoes. The Horti Farnesiani, or Farnese Botanical Gardens, have been restored to give us a sense of what they were like when they were first built in the Renaissance by Cardinal Alessandro Farnese. These gardens were recently brought back to life and we can now visit them, or at least get a sense of what they were like back in their heyday. I was lucky to visit them during the opening with my friend Livia Hengel, who wrote all about the opening here. Some pretty amazing views of . . .
You can see the Colosseum from many different points on the Palatine Hill Rome. From up here, you get a very different view of it than from ground level. You can also see the Colosseum from the main vista point, where you have views over all of the Roman Forum too. You also have lots of views of Rome's tallest dome, St Peter's Basilica. From the Palatine Hill, it's easy to see the majestic dome of Saint Peter's basilica, from all the way across the river. From the main vista point on the Palatine Hill, you can get a real birds' eye view of everything in the Roman Forum below. There are rabbits living on the Palatine Hill and once in a while you can spot one. The Palatine Hill is heaven for a community of bunny rabbits that dwell there. Considering how much green space and garden areas cover the Palatine Hill, I think those are some pretty lucky bunnies! The Palatine Museum is right at the top of the Palatine Hill. It is a pretty awesome place to visit all by itself. The Palatine Museum is divided into sections by era, starting with the earliest on the ground floor. You can actually see through the floors to some ancient structures underneath, and you can see and touch some walls from original Ancient Roman structures there. This diorama shows what some of the huts and villages would have looked like around the time of Rome's founding in the 8th century BCE. I could easily spend an hour inside this museum. It's so rich with artefacts and amazing statues and remnants of ancient structures. But even a short walk through it is worth the extra 6€ you pay to get the SUPER ticket. I am amazed at the clarity of these paintings from Nero's Domus Transitoria. This is just one of several you can see in the Palatine Museum. I have barely shown you what's inside this museum. It's truly magnificent! Come see for yourself. Greek marble Wings of Victory is just one of many ancient masterpieces you will see inside the Palatine Museum on the Palatine Hill Rome. Rome's 3rd emperor Caligula was supposedly stabbed to death here at the age of 28 on January 21, 41 CE. Since Nero was Rome's 5th emperor, this passageway must have been built by a previous emperor like Tiberius, Rome's 2nd emperor. I'm guessing that it is today called the Neronian cryptoporticus probably because Nero rebuilt it for his own purposes. A cryptoporticus (from the Greek crypta and porticus) is a covered passageway. In the case of the Palatine Hill Rome, it refers to one that Nero built to connect his Domus Aurea to other palaces on the Palatine hill. You can walk through this tunnel and imagine the emperor Caligula being stabbed to death in here. Pretty gruesome but that's the way things were back then. The Neronian Cryptoporticus is one of the sites you can only visit (walk through) with the S.U.P.E.R. ticket. Among other things, it was the site of the emperor Caligula's assassination in 41 CE. Rome's first emperor built his house on the Palatine Hill. It was surely one of the most beautiful structures of its day, and we are lucky that today, so much of it is preserved. This is just one of many amazingly preserved rooms in the House of Augustus on the Palatine Hill Rome. The paintings we see in these rooms are a perfect example of what is known as Second Style painting. The most famous examples of second-style painting are in the villas of Pompeii. In Rome, you can see them in the house of Augustus. Second-Style painting was in vogue from around 80 BCE through the beginning of the first century CE, which included the time of Augustus and his wife Livia. Second-style painting uses Trompe-l'œil to give the impression of architectural elements having depth. The artist would have also used several "vanishing points" to create the illusion of a deep, 3-dimensional space on a flat wall. The tour you must take to visit the House of Augustus uses video to demonstrate this. Room in Augustus' House on the Palatine Hill. Excellent example of Second-Style painting. During the tour of the House of Augustus, you will see a video that demonstrates the methods used to create depth in Second-Style paintings. The House of Augustus is one of my favorite things to see on the Palatine Hill. This room, "Room of the Pine Festoons", is yet another example of a fantastically-preserved second-style painting in the House of Augustus on the Palatine Hill Rome. The tour of his house takes a little over half an hour. You need to either pre-book your visit (you can do this at the gate or online when you purchase your SUPER ticket), or, you can just show up and wait for the next tour. Tours go throughout the day that it's open, in Italian or English. Visitors soaking up all the beauty of the House of Augustus on the Palatine Hill. Augustus and Livia had more than one house each. There is a famous site you can visit, called Livia's House at Prima Porta. But you can also visit the wonderful, under-visited museum of Palazzo Massimo alle Terme, where you can see amazing paintings, in fact, entire rooms, from Livia's house at Prima Porta. I highly recommend this visit. Livia was Augustus' second wife, and was the first Empress of Rome. She had her own house, right next to that of Augustus. Here, on the Palatine Hill, you can visit her house, with a tour as you must with the House of Augustus. And, as with the House of Augustus, the frescoes are incredibly intact. There is also an excellent light show that brings some of the paintings further to life. This tour takes about half an hour and is so worthwhile. I can't recommend these enough, especially if you love Ancient Rome! The House of Livia on the Palatine Hill is so worth visiting for the history but also to see the incredible paintings. There is a new exhibit on the Palatine Hill as of this writing (2018), and you can only visit it with the SUPER ticket. The visit has two items, but they are sort of unrelated to each other. First is the Aula Isiaca, which means "Room of Isis", which was made during the time of Augustus, and has those 2nd style paintings I love so much. They depict, as you might imagine, paintings related to the Goddess Isis. The Aula Isiaca (room dedicated to the goddess Isis) has stunning second-style paintings from the time of Augustus. You can see this on the Palatine Hill Rome with the S.U.P.E.R. ticket. The other thing you can see in the same space, is the Mattei Loggia. A loggia is, in this case, a roofed area attached to a house or villa. It's named "Mattei" in reference to the other wealthy Renaissance family (besides the Farneses) that owned land and built things on the Palatine Hill. These paintings are all in the "Grotesque Style", which was inspired by Nero's Domus Aurea. The Mattei Loggia is beautifully preserved, and shows paintings from the Renaissance that reflect the influence of paintings found in Nero's Domus Aurea. This round temple in the Roman Forum was dedicated at first to Romulus, the young son of the Emperor Maxentius. Romulus died as a child, and was deified, so this temple was thought to be to him. It's also referred to at the temple to Jupiter Stator. This is a closeup of the exterior of the Temple of Romulus, as seen from high on the Palatine Hill Rome. You can go inside the Temple of Romulus with the S.U.P.E.R. ticket. It's really special just to be inside, but also to see the frescoes from the medieval. There are also some artefacts from the Roman Forum and Palatine Hill. Inside the temple of the Divine Romulus, you can see artefacts found in the Roman Forum and Palatine Hill Rome. You can also glimpse this temple from above if you visit the church of Santi Cosma e Damiano, which you can enter from the via dei Fori Imperiali. In the 5th century, around the time Christianity had really taken hold in the Roman Emprire, but also when the Roman Empire was in its decline, this church was built in the Roman Forum. The medieval church of Santa Maria Antiqua is one of the most amazing things to see on the Palatine Hill Rome. The whole structure was buried in an earthquake in 847, which meant it was completely preserved and undisturbed until it was discovered in 1900. They didn't excavate for another few decades. In 2016, the church opened to the public. Santa Maria Antiqua - also called "The Sistine Chapel of the Medieval", on the Palatine Hill Rome. Now, you can visit Santa Maria Antiqua on the palatine Hill Rome, but only with the S.U.P.E.R. ticket. I think visiting this site is worth the extra 6€ alone. The frescoes in this church are astonishing. They are also from several different timeframes, and give scholars a whole new view on Christianity in the Middle Ages. Now, you can visit Santa Maria Antiqua ("Old Saint Mary's") with the S.U.P.E.R. ticket. They call this church "the Sistine Chapel of the Medieval", and I find it astonishing. Many of the frescoes are so intact, and truly beautiful. When you go in, there is background music playing, something like Gregorian chants. And because it's now only accessible with the S.U.P.E.R. pass, there are very few people in there, even in high season. So between the lack of crowds, and the music, and the stunning art, you really feel transported in time to this ancient church. What is the best way to visit the Palatine Hill ROME? In my opinion, the best way to visit the Palatine Hill your first time is with a guided tour. The area is huge, and as I said above, there is so much to see. A good tour, and good tour guide, can help you focus on some of the most interesting parts, while giving you the info and background stories to tie it all together. If you go on your own, you might consider getting the audio guide (you can decide on-site), which actually comes on a sort of smart tablet, and includes some visual aides as well. If you have been before, or are feeling adventurous and want to go on your own, I recommend starting your Ancient Rome visit here. First of all, it's the best place to purchase a ticket on-site, as there are almost never any lines, certainly not long lines. Second of all, you will be high up, and can then make your way down into the Roman Forum. Then you can visit the Colosseum once you exit the Forum. How much does it cost to visit the Palatine Hill? The ticket you buy to enter the Palatine Hill is the same ticket to the Colosseum, and the same ticket to the Roman Forum. In other words, you buy one ticket for any of these sites, and they are all included. A standard ticket costs 12€. There is a 2€ fee to pre-book this ticket online. With the standard 3-day Roma Pass, you get to visit 2 sites for free. Let's say that one of the sites you want to visit free (and of course skip the line), is the Colosseum. I find this to be the most common site people use the Roma Pass for. Well, when you use the Roma Pass, you still receive an actual ticket to the Colosseum. And on that ticket, it says, good for entry to the Colosseum/Roman Forum/Palatine Hill. So, you can use the ticket to visit the Palatine Hill. Basically, if you use the Roma Pass to visit the Colosseum for free, you get two other sites, the Roman Forum and the Palatine Hill, for free. And this all counts as ONE site as far as the Roma Pass is concerned. The Rome City Pass, offered by TicketBar, also includes 1 airport transfer, skip the line entry to St. Peter's Basilica, Hop-on/Hop-off bus, and other discounts. All this is done completely with your mobile device. 67.50€. Buy it here. The Best of Rome All Access pass, offered by Tiqets, also includes skip the line entry to the Vatican Museums + Sistine Chapel, and St. Peter's Basilica. All this is done completely with your mobile device. 75€. Buy it here. A reduced ticket is 7.50€. This price is for Europeans between 18-25, journalists, and European teachers. For anyone disabled and their companion if the companion is assisting that person. You must show proof of disability. To see the more specific requirements, and see if you qualify for free entry, visit the official page for the Palatine Hill Rome, CoopCulture. What is the S.U.P.E.R. ticket and should you get it? Just above, I listed the standard, discounted, free tickets and passes for the Palatine Hill. There is another type of ticket that I highly recommend, called the S.U.P.E.R. ticket. S.U.P.E.R. stands for "Seven Unique Places to Experience in Rome". With this ticket, you get to see 7 amazing places on the palatine Hill and Roman Forum, that you cannot visit otherwise (see higher up on this page). You cannot use the Roma Pass or any other pass to get inside the sites on the SUPER ticket. But you CAN upgrade any standard Colosseum ticket from the 12€ version to the S.U.P.E.R. version simply by going to the ticket office and paying the extra 6€. This means that for whatever visit/tour you may do, for which you will get a standard entry ticket to the Colosseum/RomanForum/Palatine Hill Rome, you can always add on the SUPER sites if you want. You can buy tickets to the Colosseum/Roman Forum/Palatine Hill online, on the CoopCulture website. You can also buy them at many online ticket vendors that offer mobile tickets. And finally, you can buy the tickets right on site. I ALWAYS go to the Palatine Hill Rome ticket booth and entry on via di San Gregorio 50 to buy my tickets to the Colosseum, or Roman Forum or Palatine Hill, because I find there is almost never a line, and when there is a line, it moves much more quickly than that at the Colosseum. Here's the entry to the Palatine Hill. The ticket booth is inside that arch, immediately to the left. I took this in the middle of the morning in high season, when the lines for the Colosseum were snaking around the building. I can spend all day on the Palatine Hill. The Palatine is a pretty enormous stretch of land (its circumference is 5,700 feet, or 1,740 meters). But besides the size of it, there is just so much to see, if you want to. I think for most people visiting Rome with limited time, you will typically spend anywhere from half an hour to a couple of hours visiting the Palatine Hill Rome. But if you use the S.U.P.E.R. ticket, you will need more time, even on a single day (You need almost two full hours if you want to visit the houses of Livia and Augustus alone). When should you visit The Palatine Hill Rome? The Palatine Hill Rome is open daily. It is closed only on Christmas Day and New Years Day. The Palatine Hill (and Roman Forum and Colosseum) all open at 8:30 every day. Closing time is "one hour before sunset", and so changes a lot throughout the year. Last entry is one hour before closing time. In the peak of summer (from the last Sunday of March to August 31), 19.15, with last admission at 18.15. In the middle of winter, from the last Sunday of October to February 15, closing time is 16.30, with last admission at 15.30. For the complete schedule, visit CoopCulture. In terms of when to visit the Palatine Hill during the day, when the weather is warm, I would always suggest visiting it during the hottest part of your visit to Ancient Rome. This is the only one of the three parks that has plenty of shade and places to sit down. The Palatine Hill Rome is full of shady spots and lots of places to sit. The Colosseum and Roman Forum are both devoid of shade and seating. So if you have a morning visit, go to the Colosseum first, then the Roman Forum and then the Palatine Hill closest to noon. If you have an afternoon visit, start at the Palatine Hill, work your way down to the Roman Forum, and finally visit the Colosseum. The Palatine Hill is next to the Colosseum, across from Capitoline Hill, and above the Roman Forum. It also looks over the Circus Maximus and can be seen from the Aventine Hill. You can enter the Palatine Hill directly on via di San Gregorio 30. You can also access the Palatine Hill from the Roman Forum, simply by climbing up, either through the middle (and the Farnese Gardens), or on the side of the Roman Forum where the Arch of Titus is. You can leave the Palatine Hill at the entrance on via di San Gregorio 30, or you can go into the Roman Forum and leave it from there, at the various exit points, in many different spots, depending on where you want to go. You can see the various entry and exit points in the map at the bottom of this page. If you plan to come to the Palatine Hill by Metro (subway), you'll be coming by Blue Line B. The Blue Line B Metro stop at the Colosseum. You can get off here or at the next stop, Circo Massimo, to visit the Palatine Hill. Get off at Circo Massimo (closest to the Palatine Hill), or at the Colosseo stop (closest to the Colosseum but also only about a 10 minute walk from the Palatine Hill entrance). If you decide to reach the Palatine Hill by bus, remember that on Sundays, the via dei Fori Imperiali is completely pedestrian, so you will have to get a bus that stops nearby. If you have a smartphone or device with data, you can easily use Google maps to see what transportation will get you there. You will want to either go to the Colosseum (Piazza del Colosseo 1) or to the Palatine Hill entrance (via di san Gregorio 1). There are many different companies offering hop-on/hop-off open bus tours of Rome. They are all similar and every single one of them includes a stop at the Colosseum. In fact, the "Colosseum" stop is actually right at the entrance of the Palatine Hill! If you are enjoying a day of walking to, from and around the Ancient Rome sites, you'll want to walk up the via dei Fori Imperiali. From Rome's Roseto rose garden, you have beautiful views of the Palatine Hill. Another option is to come from the Circus Maximus, especially if you've included some sight-seeing on the Aventine Hill, and maybe to the orange tree garden or the rose garden. There is no restaurant per se inside the Palatine Hill. What you see below is pretty much it for refreshments. Definitely bring some water, or a water bottle you can refill. You should not bring a major picnic to the Palatine Hill, but I do see people eating sandwiches and think this is a good idea. In fact I suggest bringing a bar or sandwich so you can snack and not have to leave due to low blood sugar. The Palatine Hill is the only one of the three parks that has lots of places to sit, grass, and plenty of shade. On the other hand, there are plenty of places nearby to eat, before or after your visit, and/or in between visiting the Colosseum and this park. It's not easy to navigate the winding, uneven paths and roads that cover the Palatine Hill. There IS better access for people in wheelchairs at both the Roman Forum and the Colosseum. You will find clean, modern bathrooms to your left right after you come into the Palatine Hill Rome from the via di San Gregorio entrance. There is almost always a line and crowd around this drinking fountain on the Palatine Hill Rome, right next to the Farnese rose gardens. You will find bathrooms hidden behind that ivy. On the below map, you can see where the Palatine Hill, Roman Forum, and Colosseum are in relation to each other. 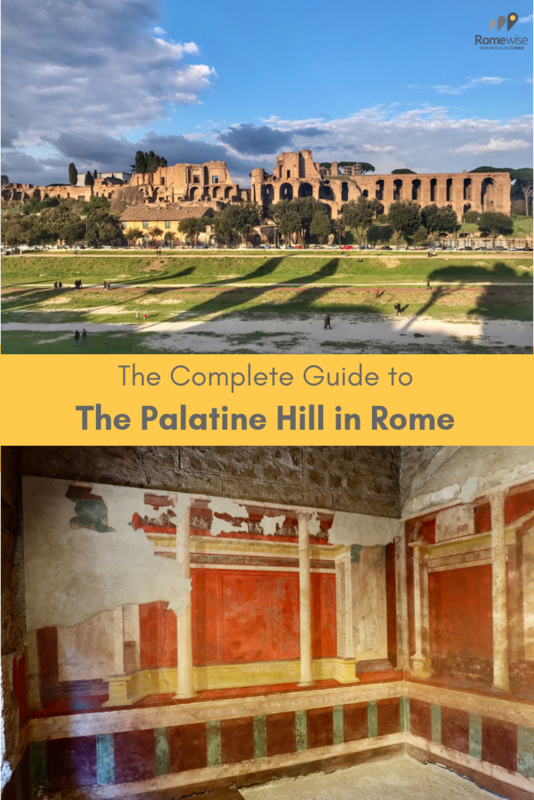 I've also included entry and exit points, and specific places of interest in the Roman Forum and Palatine Hill. Zoom out of the map to see where the Palatine Hill is in relation to the Colosseum, Roman Forum, Capitoline Hill and other points of interest. Want to share this on Pinterest? Pin it here!